Every now and then, a project comes along that lets you contribute (in however small a way) to something that you believe in. Most of the time, you accept a project for one or multiple of the following reasons: it pays well, it presents a challenge, or you get to work with great people. But every now and then, a project comes along that lets you contribute (in however small a way) to something that you believe in. My latest project falls under the latter description, and it launches today. Rosa guiden is a industry directory for organizations and individuals who work with feminism and gender issues. The purpose of the site is to make it easier for clients to find that expertise, whether it is within education, communication or other services. The long term goal is for it to include all agents within the Swedish feminist field. The initiator to Rosa guiden is Feministiskt Perspektiv; the largest feminist focused news site in Sweden. 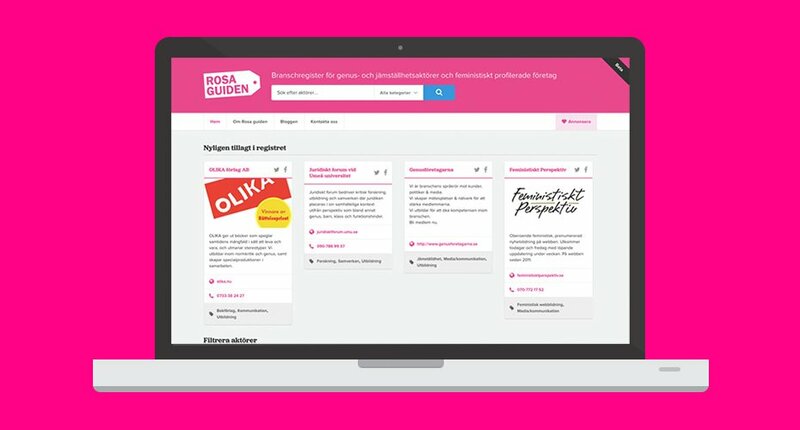 I’ve called myself a feminist since I first learned the definition of the word, and it’s been very fulfilling to work with Feministiskt Perspektiv to realize their vision for Rosa guiden. I designed and developed the website in the course of 1-2 weeks and, as always, the finished product is built on WordPress. The logo is designed by the Stockholm agency Havanas. It’s been a really fun project, and I’m looking forward to see how far Feministiskt Perspektiv will take it.